This package was approved as a trusted package on 7/20/2018. Remote desktop - is it the best solution? A business application user needs to access applications and their functionality. 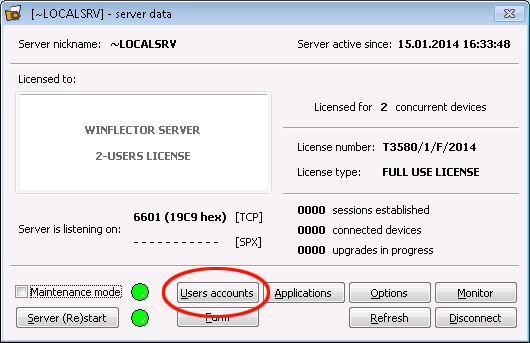 In this case it is preferable to use a Winflector server, which enables the Windows application to be accessed as if they were locally displayed on the user's desktop. This way, a middle layer of remote desktop is eliminated, along with its increased bandwith usage and heavy interface, which makes it harder to use the actual application and increases the server load. Another advantage of this solution is limiting user access only to application functionality, hence increasing the server security. Remote desktop is a good solution when one wishes to remotely administrate the computer. In this case, it is efficient to use VNC software or single-user Terminal Services, which is included in the operating system. This is a fully functional version of Winflector software for two concurrent workstations for free. Show-ToastMessage "$packageName installed." "Version $env:packageVersion." $ahkFile        = Join-Path $toolsDir "WFCuninstall.ahk"
© Era Software SC, © OTC S.A. This discussion is only about Winflector Client / Winflector Virtual Terminal(Install) and the Winflector Client / Winflector Virtual Terminal(Install) package. If you have feedback for Chocolatey, please contact the google group. Tell us what you love about the package or Winflector Client / Winflector Virtual Terminal(Install), or tell us what needs improvement. Deployed from e27d7a207f. You are on web.2. UTC time is currently 25 Apr 2019 13:05:04 +00:00.